Choosing a ‘J’ Elvis topic for the A to Z Blogging Challenge was a bit difficult for me. I had to decide between one of my favorite Elvis songs “Just Pretend” and one of my favorite Elvis movies Jailhouse Rock, but in the end I had to go with my favorite Elvis friend Jerry Schilling. Jerry Schilling met Elvis when he was asked to play football with the gang when Jerry was just a teenager, as he was about 10 years younger than Elvis. Jerry and Elvis remained friends until the day Elvis died. 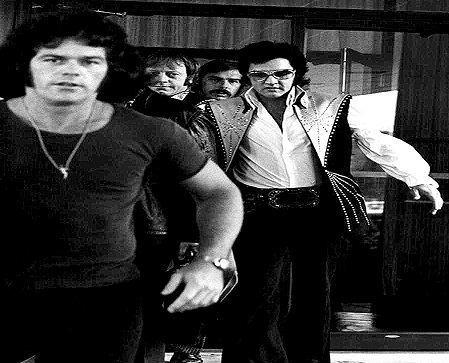 Along with being one of Elvis’ closest friends, Jerry also worked for Elvis off and on over the years. Since Elvis’ death, Jerry has consulted on and produced many Elvis documentaries, managed the Beach Boys (and others), remained Priscilla’s close friend and is still very involved with Elvis events, wrote a book about his friendship with Elvis called Me and A Guy Named Elvis and has been my Elvis crush for the past several years (even though he is a few years older than my father). Jerry stands like Elvis and walks like Elvis. Jerry has a beautiful voice (I think that’s what does it for me!) and wonderful, crazy hair. He’s so nice and was there for Elvis in life and in death. Jerry was also the liberal of the Memphis Mafia, which endears me to him even more. I have been fortunate enough to meet Jerry on five occasions, had my picture with him twice and have seen him at Elvis events many times. The first time I met Jerry was when I checked him into the Peabody Hotel where I worked as Front Desk Manager. I remember literally petting his hand as I gave him his keys and told Jerry to call down if there was ANYTHING he needed. The next time I met Jerry was during Elvis Week 2007, the 30th Anniversary. He autographed his book for me. Two years later in 2009, I met Jerry outside the Elvis Radio booth at the old Graceland plaza. I went up to him and was totally geeking out and he took my hand and told me to calm down. He put his arm around me while his wife took the photo of the two of us. I wouldn’t see Jerry again up close and personal for another seven years. It was the Opening Weekend of the Guest House at Graceland in 2016. I was sitting in the lobby and in walks Cynthia Pepper (Elvis’ costar from Kissin Cousins) and Marion Cocke (Elvis’ nurse), and they sit on the couch next to me. Then Jerry walks in and comes over to say ‘Hi’ to them and looks over at me and says, “Hi. How are you?” Literally frozen and too excited to talk right now thank you was what I was thinking. The following year during Elvis Week 2017 the 40th Anniversary, I got my second photo with Jerry (a selfie this time) after stalking him a bit after the Memphis Mafia Reunion. I made my way to Jerry. I was right behind him, but he walked away. So I followed him and was again about to ask for a photo, but he suggested we go outside. Fine with me, my iphone will take better photos in the daylight. I was about to get my photo with him as I called out “Jerry!” he turned around and looked at me, but a professional photographer wanted to take his photo with his Music Note on Beale Street so I followed. And when he was finished he turned around, and I sweetly and calmly asked if I could please have a photo with him. Jerry said ‘sure’ and put his arm around me. I took our selfie – twice. The first one no smile, the second one a sort of an Elvis half grin. All of this following Jerry around and finally getting my photo with him took about 15 minutes. I look at Jerry every night as the Joe Petruccio painting “You’ll Never Walk Alone” of Jerry and Elvis hangs proudly on my wall signed by Jerry and Joe. I had wanted this painting since I first saw it in August 2009. I saw it hanging on the wall at the Elvis Presley’s Memphis Grand Opening in March 2017 and bought it. Joe said he painted 25 of them and thinks mine was the last one in circulation. Jerry obviously has the first one. What is your favorite movie, song, book, topic about Elvis that begins with ‘J’? Please comment below. If you missed any of my Elvis ‘A’ to ‘I’ topics, please click here. Remember to check back tomorrow to see what ‘K’ topic I’ve chosen for Elvis. Great post! The pictures are so cool! What wonderful memories. thank you! i treasure them! I just love reading about all of your Jerry encounters in detail. Jerry was always one of my favorite Memphis Mafia original members. He is such a good looking man, very well soft-spoken and a true supporter of preserving Elvis’s Legacy. I was able to meet him in 2012 at Marion’s dinner at the Peabody. I had asked him if I could get my picture taken with him and he reluctantly agreed but at least he did it. I enjoy hearing all of his interviews throughout the years and I especially like the interviews he did on the documentary “Elvis by the Presley’s.” I am really looking forward to Saturday’s HBO documentary and hear some new input from him. thanks julie! yes i think i love jerry’s voice the most. There is just something very calming about his voice, he’s such a sincere person! yes i think if i am every lucky enough to meet jerry again i am just going to thank him for everyone he has done. thanks Vidya! yeah i like Judy. please check out all my elvis blogs – more than just the a to z challenge. Yeah I first discovered and fell in love with elvis through his movies when I growing up. Thanks so much for reading!